The petanque competition takes place at the courts of petanque club De Schorpioen in Wondelgem. The club is housed in a completely new building. Click to see how to get to De Schorpioen. 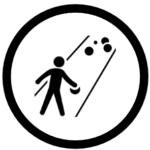 The petanque competition is a team tournament. Doubles: a team consists of 2 players- each player throws 3 balls. Triples: a team consists of 3 players- each player throws 2 balls. Matches are played in according to the Swiss system. The game is played up to 13 points.